﻿ What kind of damage can woodpeckers cause? USA Wildlife Removal Education Guide - What kind of damage can woodpeckers cause? What kind of damage can woodpeckers cause? The primary damage from woodpeckers is holes in your house! 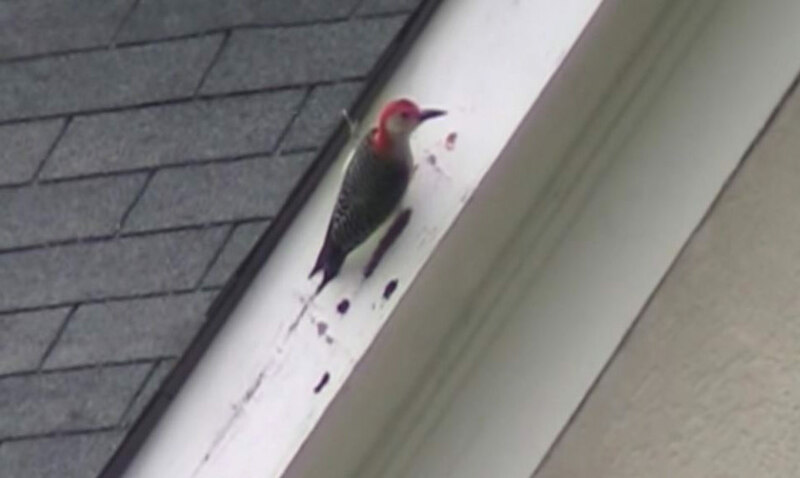 This occurs most typically in wood, such as wood siding, shingles, or trim, but woodpeckers can also pound out holes in other housing material. They most commonly drum on houses when making territorial drumming noises, not because they are in search of food inside your walls. If you need help, we service the entire USA! Click here for a wildlife removal specialist in your town! Woodpeckers, while beautiful and majestic, can also be destructive. Each year many of us put out special feeders filled with suet designed to attract woodpeckers. We enjoy their diverse appearances, clever style of eating, and antics during flight. They not only have distinctive plumage, but make a “drumming” noise that is also unique. These hardy and beautiful birds are beneficial as they consume thousands of pounds of nasty insects, like mosquitoes, ants, termites, and more each season. They can also clean bug infestations from trees, saving them from certain death. Unfortunately, the occasional woodpecker will single out your house to “peck” holes in or for nesting. In spring, as males set up territories to try to attract a mate, they use a technique called "drumming." Most of the times they choose a dead tree trunk to practice their matting song on, but occasionally they do need to find a substitute surface. As we take out more dead trees in the name of progress, woodpeckers may have discovered metal gutters, siding, windows, and other parts of your home to “drum” on. Serious structural damage can occur when the persistent woodpeckers drill holes in window frames, siding, and roofing. The damages can allow water, fungus, and mold to grow inside the wood, causing it to rot away. Structural damage can also occur if support beams are damaged by pecking or boring. The Most recognized woodpeckers around are the red headed insect eaters that are immortalized in books, films, and cartoons. These are the birds that bore into the trunks and branches of trees to get at the larva that hatches deep inside. The birds don’t just start drilling into the wood just anywhere. They have extremely sensitive hearing and keen eyesight. They can actually hear a larva under the bark. They bore in that area just deeply enough to access the insect and then extract it with their long, sticky and bristly tongues. As you would expect, Small woodpeckers make small holes, while larger woodpeckers tend to make larger holes. When you see a huge hole pecked in a tree, it is because the insect population is so thick in that area of the tree it requires a lot of boring to get to them. The birds will dig and drill deep into the wood to clean out all the bugs. Think of it like cleaning out a wound so that it doesn't get any worse. Damages to the tree will occur when some woodpeckers make nesting holes in living trees, or feed an excessive amount on one tree. Most times, as mentioned before, they choose a near-dead or already dead tree as a nesting tree, however, when trees are scarce, or they are nesting in areas where dead trees are cut down, the birds have to resort to living trees. Smallish holes only interrupt a small section of the living layer of the tree. If left alone, the cut edge of the hole tends to heal up within a few years. Instead of a damaged gash, it leaves a small hole with a completely covered edge. Squirrels will begin to use this as a nesting hole for years after. Unfortunately, the squirrels will enlarge the opening, keeping the tree from healing properly. This makes it possible for fungi to get into the living portion of the tree. The fungus begins to grow, and eventually shortens the life of the tree. Another type of woodpecker that definitely causes extensive damages certain trees called a sapsucker. These birds drill very small pencil sized holes through the bark and into the soft living tissue (cambium layer) of the tree. The bird makes a row of shallow holes around the tree, and then begins another, and another, drilling up to 10 rows of holes, one below the next. This is how the sapsucker feeds. These holes then leak sap, and the birds return each day to lap up the sap. This constant drinking keeps the wounds on the tree fresh. On smaller trees, it is possible that the sapsucker will encircle the tree with rows of holes. This can actually damage the tree to the point that the flow of sap from the roots can be cut off and the tree will soon die. One serious problem with this method of feeding is a terrible threat to orchards. Fruit trees often make sweet and tasty sap. This is a special treat for the sapsucker. Unfortunately most fruit trees are not grown to a large diameter. Because to this treat, a sapsucker feeding on fruit can present a real threat to the health of an orchard. Go back to the main Bird Removal page for more information about What kind of damage can woodpeckers cause?.